In the April 16, 2013 Ask The Headhunter Newsletter, a parent asks how her son, a new college graduate, can get a job when he’s got no experience. How can he get experience when he can’t get hired? He’s done internships and earned good credentials in school, but keeps losing out to other applicants. How can he get in the door for an interview without experience? It’s difficult to guess at the problem, partly because I don’t know what your son’s degree is in and what jobs he’s been applying for. But in general, he’s encountering the age discrimination problem: He’s too young! Ironic, isn’t it? Either older workers are “too experienced” and “over-qualified,” or younger workers lack skills and experience. Here’s what has become very clear to me, and we’ve discussed this in other columns: Employers demand job applicants who have done the exact job before, and who will take less money to do it. Sorry to rant, but I get fed up with companies that pretend they’re offering careers when all they offer is the same old grind. But back to your son: What can he do? New college grads do get jobs, so your son needs to reconsider “How to Start A Job Search.” (Few schools teach effective job hunting to their students.) He should also consider what is an acceptable substitute for experience and skills. I think the most compelling substitute is a personal referral for a job — from someone the employer trusts. This doesn’t mean your son will get hired because he knows someone. It means he may get hired because someone will vouch for his intelligence, for his work ethic, and for his ability to learn a new job quickly. Even a cold-blooded employer realizes it can hire talent at a lower cost if it starts with a new grad who shows promise. “Promise” is the key, and the lynchpin is the personal referral. Contact the alumni office of his school, and identify people who work at his target companies — and then contact them. Talk with parents of former schoolmates — ask for their advice. Ask former professors for introductions to people they know in business and industry. Then keep talking. Trust is the coin of the realm, and your son must build it if he wants a referral. This phone call should have nothing to do with asking for a job. Make it a casual but intelligent discussion with an expert who can educate you. This is a great way to make insider contacts. I know it’s not easy to make such calls, but if you’re asking for advice and insight rather than a job, you’ll find that some people will talk to you for a few minutes. Some may take you under their wing. Why? Because people love to talk about their work with others who are interested. When you demonstrate your willingness to invest time and effort to learn about their business, you’re not likely to be shrugged off as another desperate job hunter. In short, learn to talk shop! One problem many new grads have is taking advice from people who might help them. Please see “How to Get Coached.” Don’t waste those new contacts! We can all cry that this is unfair and that employers should hire more rationally. But there are 27 million people actively looking for work in the U.S. Employers seem to think the perfect worker will come along, so why take a chance? 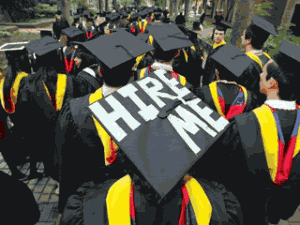 Employers do hire new grads. But with so many new grads looking for work, the personal referral makes a crucial difference. Are you a new grad looking for a job? What’s standing in your way? What are you doing to overcome the obstacles? Got advice for new grads? Join us in the comments section below! Companies also send recruiters to top schools looking for promising new graduates, and sometimes have job openings specifically tailored for new graduates. But these are competitive like everything else. A student with a 3.9 gpa at a top school is going to have an easier time of it than one with a 2.5 at a mediocre school, and engineering, business and CS majors are going to have an easier time than art history majors. Nick, your usual advice can be adapted for this situation also. A graduate may not be able to do the job, not having the real world experience, but the new graduate probably has learned a lot of useful techniques that us old timers just don’t have the time to learn. That’s a good value proposition. I am going to have my Masters in a month. I was a “non-traditional” student–having NO prior college degree, but held prestigious positions (long term) and my resume indicates this. My problem is that when I apply for jobs and the whole “MONSTER.COM” thing is a requirement, I get bombarded with the most idiotic phone calls and emails. Yeah, I have a fricken MASTERS degree in Historic Preservation and Museum Studies, 15 years experience, not to mention $90k in student loan debt and you want me to sell insurance? Seriously? Where did you see this on my resume? It’s not just the young’ens that are having problems with the recent grad thing. I had one Non-Profit ask me to do the job for FREE (they would provide me with a spot to live over the carriage house) and all of the revenue I managed to generate with my “wonderful new ideas” would be my salary (up to $50k, of course). Can you say Ramen noodles 3 times a day? Been there, done that, bought the t-shirt. Connect with local business and service organizations. The Chamber and Rotary come to mind. DO NOT ASK FOR A JOB OR JOB LEAD!!! @Scott: The reason the ATH approach works is because experience is not required. And that’s why new grads can use it effectively. It’s not about the applicant. It’s about the employer. No experience? No problem. Focus instead on figuring out exactly what the employer needs done. Then use your brains and problem solving skills to present a simple plan for how you’d do the work using the skills and brains you have. Most employers are impressed with that kind of smart, can-do attitude. It reveals a person is teachable and understands how to tackle a task. New grads reveal what’s wrong with hiring today. Employers want to know what you’ve already done. New grads have done little if anything in the work world. Does that make them unworthy of a job? OF COURSE NOT. The point is, your experience is only a small part of what justifies hiring you. Your ability and motivation to tackle the job at hand is what it’s all about. So new grads have a sort of advantage. It’s good you have no experience. It forces you to focus on what you CAN do. Just don’t be afraid to approach it this way. And that, I think, is the biggest problem new grads have: Fear of stepping up and explaining how they’d do the work if they were dropped into the job from a helicopter. The “secret” is almost stupid: To be able to show how you’ll do the work, YOU MUST KNOW EXACTLY WHAT THE WORK IS! But job applicants never really ask that question. They walk into interviews like blind mice waiting to be served cheese. More than anyone else, a new grad — just off the research/study/report treadmill — should be ready and able to research, study, and report on how they’d do a job. STUDY THE WORK, then interview. here’s advice I give all job seekers but especially new grads with minimal work experience. Don’t just list your courses, jobs, degrees. Find 6 to 10 stories that illustrate your ability to face challenges. Some examples. How you drummed up business for your after-school lawn mowing or baby sitting jobs. What you learned about responsibility and dealing with the unexpected when you were a camp counselor. Your experience working on a group assignment in college. The hours you spent and the challenges you faced learning to play the piano. Of course, someone with more work experience will pick stories from their work life, but for entry-level individuals, having a half-dozen of these kinds of stories at your finger tips when speaking to people will impress them with your ability to learn on the job. No disrespect to the parent, but the simple fact that the parent is the one writing to Nick, instead of the graduate is VERY telling to me. The graduate is the one who HAS to do the foot-work and research, because they are the one who will have to do the job. In today’s competitive market, recent graduates with zero work experience will have to start at the bottom of the ladder. Unfortunately most young graduates today aren’t realistic and simply don’t want to put in the time/effort to prove their worth. They just want someone to take their word and give them the chance. The reality is hiring an unknown is very risky and it costs quite a bit of money to hire and train someone that may not have the work ethic/skill set you’re company needs. If they were to take an entry-level job, after six months to a year of working at the company, any savvy manager will recognize a hard worker and there will be new doors/opportunities that will open up for any one he has shown their ability to produce/generate profit for the company . The best recruiting source is within one’s own company, as it provides a clear view of ones work ethic and aptitude. The simple fact that someone has a degree does not equate to a great worker IMO. Aptitude and attitude does. At the end of the day, the graduate is the one who needs to show/prove that he wants the job and that he’s willing to do the work and work hard for the company. One piece of advice for young people (and the rest of us) is to learn how to follow through and thank people. In the majority of cases when I have tried to help a young writer, they either fail to follow through with me or a contact, or fail to meet a deadline. Colleges should also teach what Nick has preached for years: How to cultivate contacts that will help you later on. Not next week, and perhaps not next month, but down the road. Also, the attitude of many young graduates (and some of their parents) is, “I have a degree, I know something, you need to hire me.” They have the belief that the sheepskin means competence and/or what an employer wants. Using Linked In to connect with alumni can be very helpful. It starts with creating a complete profile and then start the “connecting” process. Linked In can also be used to research and follow companies of interest. I got my first job out of college via someone who I knew in my major, and we had several classes together. He could vouch for my skill. Another thing: As Nick suggests in other posts, you may have to identify companies who you want to work for. I would say this would include companies that are friendly towards hiring/training new grads and those looking to switch careers. Have to disagree, at least for the jobs I hire for. I work for a high tech company, and our jobs are very specialized. We don’t expect a new grad to be able to parachute in and do the job. If a college trained students to do that, they would be shortchanging the students, because whatever methods they learn will be obsolete in five years. Learning how to learn is far more important. I look for good basic skills, creativity, understanding what they got taught in depth, and flexibility. I’m lucky if 10% of the candidates I’ve interviewed have even been exposed to what we do. But that’s okay, they can learn. I’m sure other jobs are different, but that is the way it works for us, and why we differentiate experienced candidates (who should be able to do the job) from new grads. @Scott: Doesn’t it demonstrate an ability to learn when the applicant studies your business and offers a best effort at showing how they’d tackle the job, and what they’d need to be successful? I think we’re saying the same things in different ways. Here’s one for you: If a new grad was invited for an interview, and he or she called you to ask some questions about your products/tech/biz, so they could prepare a presentation “to show you how I could contribute to your team,” how would you react? Has anyone ever done that? I certainly understand the concept of wanting to stand out when you are a new graduate looking to impress in an interview, but I disagree with some of the methodology mentioned here. If I was interviewing a new grad, I certainly would not want them asking me questions before the interview so they could prepare a presentation to show me how they can enhance my business. What do they really know about my business or any established business smack out of school? I would much rather see a more humble approach. I would much rather hear “I can’t tell you how I think you should run your business, because how can I know? I can only tell you that I am willing to learn from the bottom up – literally – whatever you need me to do I will do it willingly because I can and will learn from any and every task.” This is the attitude and approach that is sorely lacking today, because many of the new grads, especially from the elite schools, think and act like they know it all – which, of course, they don’t. I’d rather have an ambitious, confident person who understands they are starting from the bottom – than an ambitious, confident person who is starting at the bottom thinking they are starting on top. I’ve seen a lot of this type — they either get “bored” or “restless” almost immediately. @Lisa: I don’t understand your concern. A candidate need not be a know-it-all to approach the manager with a demonstration of sincere interest in the business. Sincere interest means doing independent research, and asking questions. If you don’t want an applicant asking questions to prepare a presentation, then what do you want an employee to do? Show up at a project meeting totally cold and wait for you to tell them exactly what to do? I-N-I-T-I-A-T-I-V-E. It’s spelled the same way whether a person is interviewing or already has the job. A humble approach? Sorry, but although I understand the distinction you draw between a know-it-all and someone who’s interested in doing the job the boss wants done, I also think you’re describing a machine. I can’t tell you how I think you should run your business, because how can I know? I can only tell you that I am willing to learn from the bottom up – literally – whatever you need me to do I will do it willingly because I can and will learn from any and every task. Can I have a job now? See the problem with that approach? Anybody can say it. I’d rather have a candidate who does what Nick proposes and shows some initiative. Who cares if he/she gets stuff wrong? That can be a test to see how they handle stuff. Tell him/her that the approach is completely off base (and why) and see the response. Does the candidate act snooty or try another approach with an honest effort to do the work? Please show me where I ever advised anyone – new grad or not – to do that. I have no idea what you’re talking about. And I don’t know anyone who suggests that, or who is burning out from doing it. This is a pretty difficult question to answer without knowing more specifics, though I think the article did a solid job. As with everything in life, knowing the right person (fair or unfair) can often be a major key, like you said. Some other suggestions might be volunteer work, or even starting a small business or more likely a blog (something that shows the ability to plan and follow through). And though this sounds simple, maybe the problem is that the kid has a badly written resume and/or LinkedIn profile. He might be a perfect fit for the jobs he’s applying to, but if he is applying in a way that doesn’t fully sell his skill, he’ll never get to show it in the interview. No one ever has. If they did, and they had enough background in the real world to do a good job of it, I’d call the person’s professor and ask for first crack at all of his or students. Because I’d be impressed. If they didn’t do a good job, they’d still get credit for trying. There are lots of good reasons why students don’t get real world experience in my field, so not being able to do the job is not a negative. That is one reason students don’t compete against experienced people for jobs. I’m a recent graduate with a lot of experience in university-based research (10 years), finished a PhD about a year ago, and having read all of your posts, I still don’t have the answer to the title of the post, namely, how do I get in the door (I’d like to get a starting position in the industry) without experience. This is an age-old question and it is the same problem that I had when I graduated from high school and college–how can I get job without having the experience because the only way to get the experience is to get it through having a job. It is a vicious circle, and is only broken if/when you (the young grad) is lucky enough or well-connected enough to find a prospective employer who is willing to take a chance on you. The problem is that today, given the economy and that many more experienced people are competing for jobs that only recent grads would have taken 15 years ago, it is harder to find that employer who is willing to take a chance on you (i.e., TRAIN you). Many employers today expect employees to be able to perform at 150% from day one with NO training on the part of the employer. And they don’t want to pay. Unless you do some kind of vo-tech program, very few students graduating have the kind of real world experience. They will have the theory, the ability to learn, but not the experience. Maybe it is time for employers to re-think the shifting of the burden of training from themselves to colleges and universities and be willing to invest in workers once again. That’s wishful thinking on my part. For graduates, though, I think the only way in will be through connections. The better connected they and their parents are, the better their chances of employment will be. I can confirm that things have changed in the IT industry from the time I began my career in it 20 years ago. I have a high school friend in his middle 40’s who got a Ph.D. in Computer Science in 2008 with good grades from a reputable university who still cannot get a job as a software developer. He desperately needs to find one because he is over $100,000 in debt on his student loans and the interest is accumulating. I’ve been scanning this blog for clues as to what to do in his situation since I found out about it on the PBS Newshour. Every month for the past 18 months, we have been taking a two-hour drive to a large city to attend a Java user’s group so he can network with other software developers and learn about the companies in the area to figure out which ones to target. Every meeting is sponsored by a headhunting firm that supplies the pizza in exchange for an opportunity at the beginning to talk about the hundreds of job openings they are trying to fill. Unfortunately, while he has met with and given his resume to dozens of these headhunters, none has been able to match him with a position. We ask the headhunters what the problem is, and they say it is because he doesn’t have enough of the right experience. I believe he is stuck in a kind of catch 22: He can’t get a job without experience. He can’t get experience without a job. It seems that in today’s market, employers only want to consider candidates who have already done the same job before. With today’s high unemployment, employers can often choose among multiple candidates for every position and find one who has done the same job before so they don’t have to invest in training. We ask those headhunters for advice, and they can’t seem to give much. So what should he do? I encouraged him to take the Oracle Certified Java Developer’s exam which he passed easily. It helped land a couple of interviews which was more than what he was getting before, but still nothing even close to an offer. Then I met an employee of a large well-known software firm who told me something interesting. They got burned a couple years ago when they hired a lady who had a Computer Science degree with good grades and lots of industry certifications. They had to fire her after a few months when it became apparent she could not write code. The only thing the degree and certifications proved was that she was a good test taker. I’ve put a lot of thought into this and finally hit on an analogy. Suppose you are looking to hire a wedding photographer. You interview someone who has a Ph.D. in photography from a good school with good grades. Then you ask the candidate to show you some wedding photos he has taken and he can’t do it. Would you hire this photographer? Of course not! My friend can’t show potential employers software he has written beyond standard classroom exercises because he proved theorems for his dissertation. So what I am advising him to do is to get involved in or start an open-source software project. He should choose the project very carefully to be software that employers use to solve real-life business problems. Then start a blog with links to the source code he written and allow visitors to the web site to actually run the software. It would be a sample of his work, so potential employers can see that he really can write code, not just pass tests and prove theorems. Put the URL to the blog on a business card and hand that to the recruiters rather than a resume. His resume would be on a separate page of the blog. Unfortunately, this takes a lot of time and the interest on those student loans keeps piling up. When potential employers see he hasn’t worked since graduation in 2008, they conclude there must be something wrong with him and won’t consider him, which only makes his problem worse as time goes by. @Bruce: has your friend considered teaching cs at the college/university level? I know that you wrote that he wants to work as a software developer, but I’m wondering if employers are seeing his Ph.D and considering him “overqualified”. I only know two people with Ph.Ds in CS–one has been teaching undergrads for 17 years; the other works as an SIS trainer and technical writer in the IT dept. at a large state university. The deal with Ph.Ds is not that those folks can’t do the work, but rather that I think employers have somewhat limited ideas about what they can do. The other people I know who work in IT have Bachelors’ degrees at the highest. My sister-in-law’s brother-in-law (her sister’s husband) works in the tech industry in Boston. He designs computer chips and earns six figures. I never remember him saying he has a higher degree, and I’d hear about it if he had. I do remember him saying that his employer doesn’t hire Ph.Ds in CS because they have the idea that they think too much and can’t do the hands-on work. That too seems silly–I should hope that an employer wants employees who think rather than just mindlessly performing tasks. I think you’re on the right track–he’ll have to prove he can do it before anyone will give him a chance. It sounds like he’s smart, willing to work, it is just that he can’t get through the HR barbed wire and management’s prejudices. @Marybeth: Excellent question! Yes, he has submitted applications to local community colleges, but has not gotten any responses there either. I’ll explain why getting a full-time faculty position is harder than it might seem these days, and the difficulties I faced having earned my own Ph.D. in Electrical Engineering with Computer Engineering emphasis way back in 1994. I suspect discrimination against people with advanced degrees is becoming more common as people go to grad school because the job market is so bad. Then you have to start asking whether it is ethical to leave a Ph.D. off your job application. Whether it is ethical to “dumb down” your resume could be a topic in itself. When applying for jobs outside academia, I too wasn’t getting many responses. A hiring manager actually told me that he would not hire me because he thought I was so smart that I would get bored and leave after a few months. Then I was advised by a career councilor to leave off my Ph.D. and immediately landed a job the first time I did so. It was very hard to keep quiet about my Ph.D. while I was working there. They never did find out, but I still feel very uncomfortable about having done that. I’ve often wondered how many “closet” Ph.D.’s there are hiding in the workforce. I asked the career councilor at the time whether it was ethical to leave off a degree, and was told there was nothing wrong with it because it was not a requirement for the job I was applying for. Leaving off his Ph.D. is not an option for my friend, because it would make the time gap in his resume even bigger than it already is. I graduated long ago, so it doesn’t make a difference. So why did my friend quit his last full-time job to go from a masters to a Ph.D. in the first place? He simply found computers to be quite interesting (he still does), and wanted to learn more about them. It never occurred to him at the time that getting a Ph.D. could harm his job prospects. Now he deeply regrets having pursued his Ph.D., but he can’t change the past. He worked as a TA while pursing his masters, and taught a couple of night classes at an ITT Technical Institute while pursuing his Ph.D. However, he was turned-off by the teaching environment and working conditions for adjuncts at for-profit educational institutions. He would consider teaching at a non-profit institution, but landing a full-time faculty position these days is not as easy as I’ll explain, which why he is looking for a software development position. Here is my teaching experience: When I graduated with my Ph.D., I returned to my hometown and ended up as an adjunct instructor teaching Object-Oriented Design in C++, and Operating Systems at the university where I got my masters. The interim department chair remembered me as a good student, and I had TA’ed there before. I was planning to eventually become a tenured teaching professor just like both my parents. After I was hired, the interim department chair was replaced by a new department chair who did not know me. He basically said, “Never mind that you are doing a great job. If we continue to renew your contract there is a risk that you could get tenured by default, and we don’t want to risk that happening to us again.” I went on to work as IT support staff at the same university in an environment where Ph.D.s are more common, and later on in IT support for various private businesses in town. It’s really easy work, but it’s wasting my skills because I am capable of so much more. That hiring manager was right: I get bored. So I pursue my own research interests on my own time, and forget about chasing outside grant money. I also observed the process the university used to hire new faculty members from the inside. What impressed the search committee was how much external grant money you brought in, not how good a teacher you are. I watched the candidates present their research to the committee. There was one nice young gentleman who had recently graduated with his Ph.D. in CS from UC-Irvine. His presentation was clear and well-organized, and I think the students would have truly enjoyed having him as a professor and adviser. Then we had another candidate who came across as a self-promoter with a huge ego who did not fully understand the research he was presenting because in all likelihood it was done by his research assistant. The search committee rejected the first candidate because he didn’t have outside grant money, but loved the second one because he had a large pool of grant money he could bring with him. My advice if you really want to become a faculty member would be to get a post-doc immediately after graduation, so you can build up your grants and publications under the guidance of a more established professor. After what I experienced, I no longer desire to work in academia. So basically if you have a million dollars of outside grant money, most state universities would be eager to hire you, keep most of the grant money for themselves, and pay you a tiny percentage as your salary. Many universities have non-teaching, non-tenured research faculty who only have a job as long as their grant money is coming in. My attitude is that if I had a million-dollar grant, I would create my own private company, buy whatever equipment I need, and hire my own support staff rather than lose control of it to the university bureaucracy. If you don’t have outside grant money, getting a tenure-track position, and getting tenured once you are there can be very hard. If you don’t get tenured, you have to leave. As a student, I didn’t get to see the internal conflicts among the facility. Having briefly worked in academia, and watching what happened to me and my friend, I would advise people to think long and hard before they start a Ph.D., and to have a well thought-out plan for after graduation. I apologize for the long post. Keep the helpful comments coming, and we would appreciate any advice people have. @Nick: Have you seen many people in this situation? What would you advise them to do? @Bruce: thanks for the follow-up. My current is in and my last job was in academia, so I’m familiar with this. In my last job, one of the faculty in my dept. was voted and awarded “teacher of the year”. Students loved him, and he was an excellent teacher. The Dean refused to renew his contract the following year because he “only” brought in $500,000 in grant money (and this was after the Dean had “lost” $600,000 of the profits earned by the program I worked for because she neglected to spend it/encumber it/allocate it–the Provost’s Office noticed the money sitting out there, and they sucked up every last penny of it. The result was that staff were let go and the Dean demanded that we increase the number of students in my program so she would have money to fund other faculty, projects, and labs). This is the result of states decreasing the amount of money they return to public colleges and universities. We currently only get 12% of the tuition collected returned to us–the rest is spent/allocated by the governor for other expenses and projects. And anytime there’s a budget crisis, the FIRST thing the governor cuts is education. When the economy improves, the funding is not restored, so we continue to do try to function with less and less. I’m sorry that you had such an awful experience–it really does depend upon the make up of the faculty and on the dean is (and his priorities). Sometimes it feels more like the Romper Room than a workplace with adults, but if you ever work with good (i.e., mature) faculty who can see beyond their own egos, it can be a good place to work. The Ph.D in CS I mentioned who isn’t in a faculty position still teaches, but she works for the university’s IT dept. and teaches/trains staff (and faculty) on their computer systems and software. It is still “teaching”, but in a slightly different way and format. And at one time large(r) companies used to have their own IT depts. on site, and the folks there often trained/taught not only new employees to use the companies’ computers and software, but also taught classes/sessions anytime there were updates and changes. The insurance company I worked for 12 years ago used to do this. Of course, today those jobs (internal IT staff who were teachers/trainers) have probably been outsourced to India or some other 3rd world country where labor costs are just barely a step above slavery or indentured servitude, but you never know. Your friend might consider that as a possibility (and once in, then he may find it easier to get a job doing coding). No need to apologize for the long posts–I don’t think too many people have been paying attention to what has been going on in academia–the emphasis on bringing in grant money above all else (teaching those pesky students be damned), the politics, the pettiness (the last two true not just of academia but of any employer), and the rise of a new slave labor class called adjunct faculty–part-time, non-tenured, non-benefitted employees who are needed to teach classes but are paid peanuts. One of my friends currently works as an adjunct (she has a full time day job outside of academia, but had previously been a professor for 20 years at “teaching colleges”) and makes $1,200 per course per semester. She has 50 kids in the course. That’s $300.00 per month, and all that work. The adjunct path is okay if you’re doing it to supplement your salary, but I would hate to have to rely upon it for my regular salary.